New York-based Argentinean artist Marta Chilindrón, known for her "Mobius" series, will headline the first of several events to celebrate the 50th Anniversary of Public Art of the University of Houston System. Artist rendering of "Houston Mobius"
This year, the UH System celebrates the 50th anniversary of Public Art of the University of Houston System (PAUHS), which has become one of the largest and most important collections of any university system in the nation. To commemorate the milestone, PAUHS will soon kickoff a series of signature events marking the 50th anniversary and highlighting the existing permanent collection as well as a new landmark endeavor: The UH System is the first public university system in Texas to launch a temporary public art program. PAUHS’s Temporary Public Art Program, or TPAP, will specially commission pieces from a number of world-renowned international artists. The works will initially be set in different locations within the University of Houston arts district, the academic home of UH’s visual and performing arts programs and the Gerald D. Hines College of Architecture and Design. The specially commissioned pieces will also travel to other UH System universities following their run at the University of Houston. 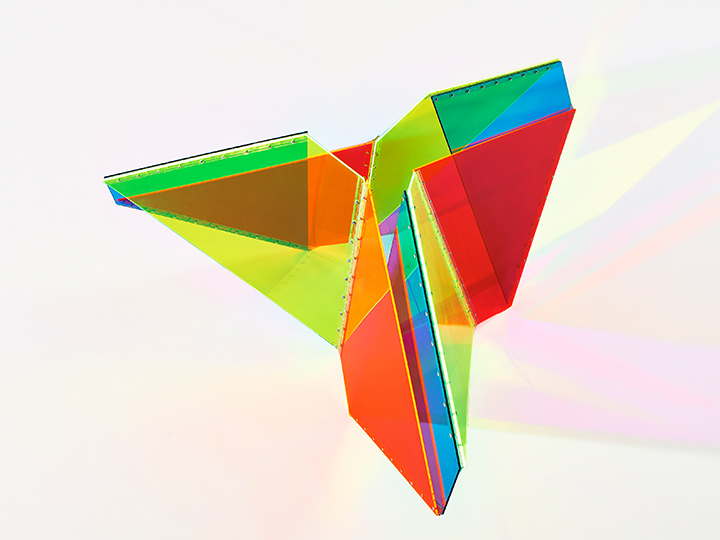 TPAP will officially launch in summer 2019 with the completion of “Houston Mobius” by the New York-based Argentinean artist Marta Chilindrón, who is known for her vibrant-colored foldable, collapsible and transformable sculptures. “Houston Mobius” (2019) is a Texas-sized edition of her “Mobius” series (initiated in 2013). The sheer scale of the piece will be almost four times the size which will make this among the largest works Chilindrón has ever created. “Houston Mobius” builds on the South American tradition of geometric abstraction and concrete art. “With the inauguration of our new Temporary Public Art Program, we are creating opportunities for artists to realize difficult projects, push their own envelope, expand their creative range and create something never seen before. 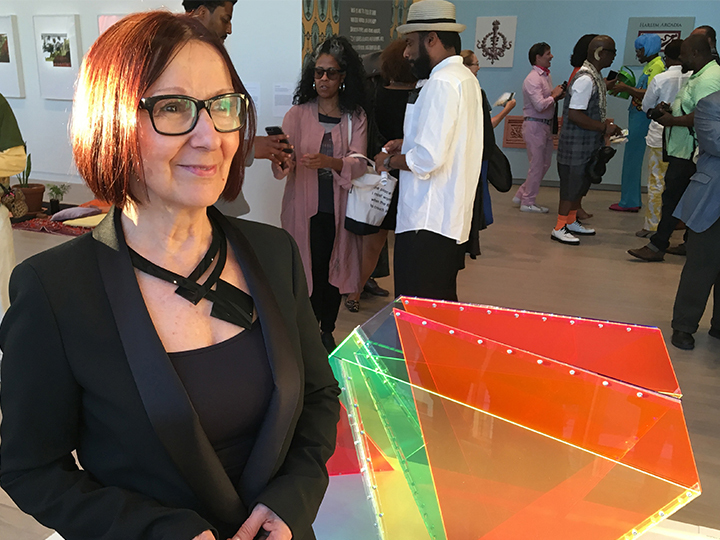 At the same time we are bringing in diverse communities to the art creation process,” said María C. Gaztambide, PAUHS director and chief curator. Chilindrón will headline the first of the anniversary event series. 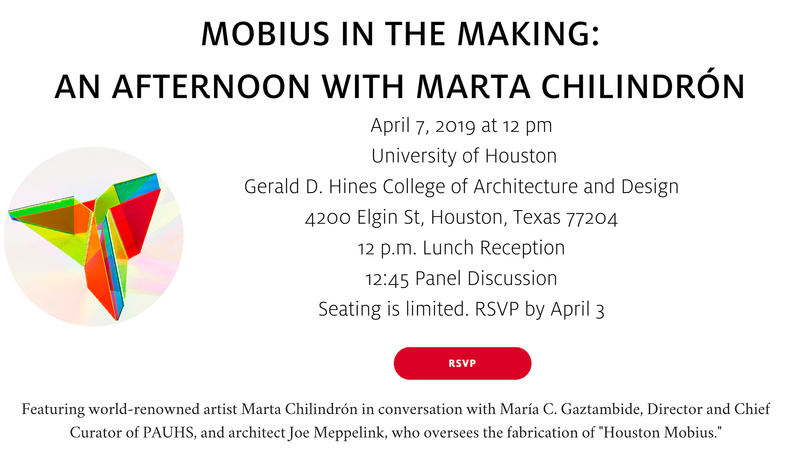 The public is invited to “Mobius in the Making: An Afternoon with Marta Chilindrón” from noon-2 p.m., Sunday, April 7, in the Gerald D. Hines College of Architecture and Design Atrium and Theater (link to map). The event is free and lunch will be served, but seating is limited. RSVP is requested by April 3. In 1969, UH became the first university in Texas to adopt a “Percent for Art” program, which has evolved into PAUHS. Today, PAUHS has matured into one of the most impressive public art collections in the country with nearly 700 objects on view at the four University of Houston System institutions: UH, University of Houston-Downtown, University of Houston-Clear Lake and University of Houston-Victoria, as well as the location UH serves in Sugar Land.